Recent events showed an extreme increase in the bitcoin price especially at the end of summer, implying situation in which the transaction fee itself was sometimes bigger than the amount to be transferred. Certainly with the SegWit and SegWit2x activations, the situation will be better, however the basic problem will not be solved. 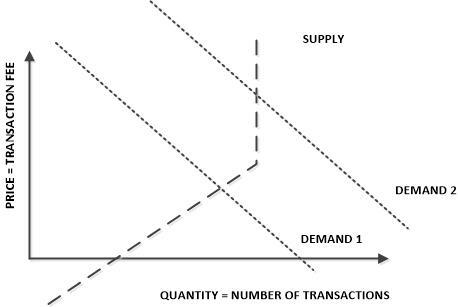 Transaction fees are basically priced on the market based on supply and demand (Figure 1). Demand curve seem to be relative simple, if the transaction fee is high, people tend to send as little amount of transactions as possible. If the price is low however, than a big number of microtransactions can be carried out without a huge cost implication. Supply curve however is a little bit special. On on hand, it might make sense to carry out transactions even if the transaction fee is zero or negative, because the miners reward is not only based on the transaction fees, but on a block reward as well. On the other hand, because of the block limit, the possible number of transactions is limited to around 7, meaning that the supply curve will change to vertical at this point, meaning that the supply is perfectly inelastic. Figure 1, supply demand curve for the Bitcoin transaction fee. Figure 1, shows that cause of the fast increase of the transaction fee pretty well. As Bitcoin is slowly reaching the mainstream adaptation, the demand curve will generally increase, slipping to right and high. As soon as the demand curve reaches the vertical part of the supply curve, even a small amount of change in the demand results a huge increase in the transaction fee. The situation will be better, but actually will not be solved by the SegWit activation, as the vertical point of the supply curve will only be at a higher value but do not disappear totally. As a consequence, we will face with the same problem probably in a year as the general demand for Bitcoin transaction increases.